QCAS is dedicated to... the enjoyment of birds..
Field Trips are the primary means by which we go about the enjoyment of birds. QCAS has at least one field trip - a visit to a local habitat for the purpose of observing nature - every month. While our focus is usually on birds, we observe all aspects of nature, and we occasionally schedule a trip primarily on plant life. Bird Counts help advance our knowledge about birds. The Christmas Bird Count (CBC) is an early winter census of bird populations that has been conducted every year since 1900. QCAS members typically participate in six counts in eastern Iowa and western Illinois. 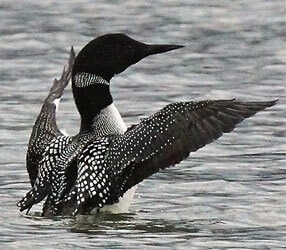 The Illinois Spring Bird Count falls on the Saturday between May 4 and May 11, near the peak of song bird migration. Sponsored by the Illinois Department of Conservation, QCAS has participated in this count without interruption for over 50 years. In addition, the chapter has supported the advancement of science by funding research studies of plant and animal life at local habitats including Milan Bottoms, Nahant Marsh, and Manikowski Prairie. Nahant Marsh. QCAS members conducted the initial botanical surveys at Nahant and have conducted avian surveys to document bird life at the marsh over a period of several years. Port Louisa National Wildlife Refuge. QCAS installed and maintained 20 bluebird boxes on a prairie restoration on the refuge. We have also participated in the autumn collection of prairie cord grass seed and the spring planting of the cord grass plugs germinated from that seed. Milan Bottoms. QCAS sponsored surveys of avian life in Milan Bottoms and participated in public advocacy efforts to preserve the biological integrity of this site. Lyndon-Agnew Prairie. QCAS members participate in ongoing efforts to remove invasive plant species, especially sweet clover, from this prairie remnant. Based on a common interest in wild birds, fellowship is part of all QCAS activities, particularly meetings and field trips. QCAS holds monthly membership meetings during the academic year, September through May, on the second Thursday of the month beginning at 7:00 p.m., at the Butterworth Center in Moline. Every meeting includes a presentation on a natural history or conservation topic. Topics run the gamut from butterflies, to endangered ocean life, to ice-age geology, and, of course, to birds. Birding presentations span the globe from the Arctic to the Antarctic, with stops in the tropics and the Midwest. QCAS publishes a local newsletter, Mississippi Currents, six times annually, keeping our members informed about issues that may impact the local environment. The QCAS is dedicated to... education of youth for the benefit of future generations. Every January, beginning in 1967 when it was still the Tri-City Bird Club, QCAS has held a program on Bald Eagles. It started as a program about Bald Eagles on Saturday night followed on Sunday by a field trip caravan to view Bald Eagles. Over the years, the Eagle Program has added sponsors and developed into Bald Eagle Days, a regional environmental fair that attracts approximately 15,000 visitors annually. In addition to Bald Eagle Days, QCAS members present educational programs when requested, particularly about bird identification. On February 12, 1948, a small group officially founded the Tri-City Bird Club, an organization whose purpose was to further interest in the study and enjoyment of birds. The group appealed to both the casual observer of birds and the serious student of ornithology. 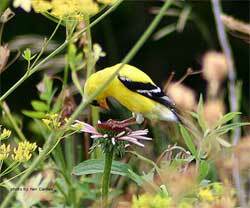 In 1976, the group reorganized as the Quad City Audubon Society, a chapter of the Illinois Audubon Society. Then in 1990, QCAS became a chapter of the National Audubon Society. Throughout its evolution, the organization has remained faithful to the primary purpose of promoting the enjoyment of birds.